On April 9, 1959, NASA formally introduced to the nation and the world its seven Mercury astronauts. The event took place in the ballroom of the Dolley Madison House on Lafayette Square in Washington, D.C., which then served as the first headquarters of the new space agency. After a brief photo session, for the next 90 minutes the new astronauts responded to numerous questions from the reporters gathered in the ballroom. For most of the men, this was a new experience, as they had little prior exposure to the media in their previous jobs as test pilots. By the time the event concluded, it was clear to them that their lives had changed forever, and public attention would be as much a part of their jobs as training for and flying in space. The seven men seated at the table in that ballroom were the survivors of a lengthy and arduous selection process to become the nation’s first astronauts. The agency that presented them to the world was itself only six months old, and no one knew the right criteria for selecting people who would travel into the unknown realm of outer space. When choosing who would make the best astronauts, several high-risk professions were considered before NASA. However, with President Dwight D. Eisenhower’s concurrence, it was decided that the best candidates would be found among the nation’s active military test pilots. From that group of elite men, 110 were selected based on their performance and medical history for a top-secret briefing on what would be asked of them as astronauts, as well as preliminary medical, physical and psychiatric evaluations. Thirty-two men survived that step and went on to more rigorous and comprehensive screenings. The candidates first underwent a weeklong series of intensive medical examinations at the Lovelace Clinic in New Mexico. This was followed by another week of arduous physical and psychological fitness testing at the Wright Aeromedical Laboratory in Ohio. The purpose of those two weeks of extreme screening was to find the absolute fittest men for the job of being the nation’s first astronauts. Those seven men sat at the table in the Dolley Madison House. Left: Mercury 7 astronauts on the cover of LIFE magazine (clockwise from lower left): Cooper, Glenn, Schirra, Shepard, Slayton, Grissom and Carpenter. Right: The wives of the Mercury 7 astronauts on the cover of LIFE magazine (clockwise from lower left): Trudy Cooper, Annie Glenn, Jo Schirra, Louise Shepard, Margie Slayton, Betty Grissom and Rene Carpenter. Images courtesy of https://www.originallifemagazines.com/. As much as the Mercury 7 astronauts were suddenly thrust from their relative anonymity as test pilots to celebrated heroes even before they flew in space, so too were their wives jolted into the celebrity spotlight. 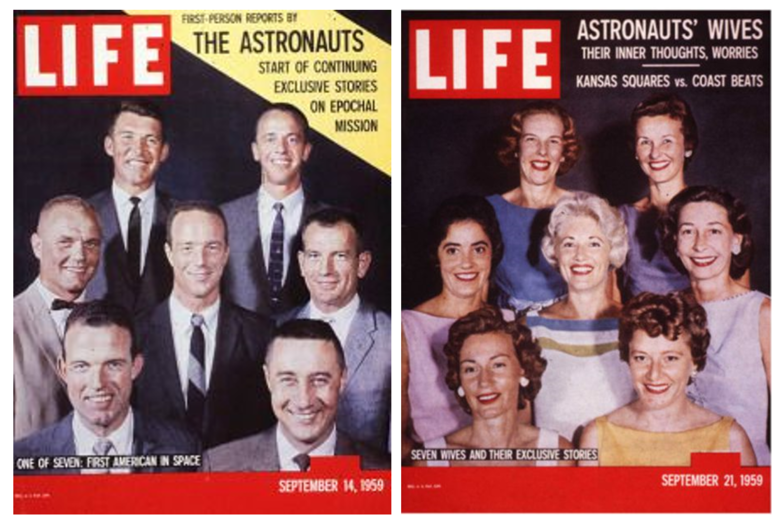 NASA arranged for exclusive deals with LIFE magazine to cover the astronauts as they progressed from newly minted heroes to actually flying in space, and the deal extended to coverage of their wives, who stayed home. The Mercury 7 astronauts went on to have stellar careers in the space program. All but Slayton, who was grounded by a heart murmur, flew pioneering Mercury missions of increasing duration between 1961 and 1963. Slayton was eventually reinstated and flew on the Apollo-Soyuz Test Project, a joint American-Soviet space flight, in 1975, becoming the last of the original group to fly in space. Carpenter made his single trip into space during the three-orbit Mercury 7 flight. Cooper flew the longest Mercury mission in 1963 and, two years later, went on to fly on the then record-breaking eight-day Gemini 5 flight. Glenn became the first American to orbit the Earth in 1962, and returned to space in 1998 as the oldest person ever to fly during Space Shuttle Discovery’s STS-95 mission. Grissom flew the second suborbital Mercury mission in 1961, the first Gemini mission in 1965, and was designated to command the first Apollo mission when he died in a fire during a launch-pad training exercise. Schirra was the only person to fly Mercury, Gemini and Apollo missions, accomplishing the first rendezvous and commanding the first crewed Apollo flight. After becoming the first American in space in 1961, Shepard was grounded by an inner-ear condition, but was later reinstated. He became the only one of the Mercury 7 to walk on the Moon during Apollo 14. Read the Johnson Space Center History Office oral histories with Carpenter, Cooper, Glenn, Schirra and Shepard.